Many of our fountains can be customized according to your needs. If you have a wall or floor space for which you need a fountain in a specific size, or would like a different finish type or color, call us and we’ll help you find a solution. We are happy to make every effort to assist you in your search for the perfect fountain. Let us know what you’re looking for, and we’ll promptly get back to you with a custom quote. LightWeight Slate™ is a thin layer of genuine Indian slate fused with a pliable surface. This new technology substantially reduces the weight of the fountain and increases design options because of the new flexibility of the slate. Our new LightWeight Slate™ products weigh less than one third of their "heavyweight" counterparts. These products are easier and less expensive to install as they do not require structural modifications for mounting. Colour finish is applied after fountain is ordered. Available in Natural Copper, Clear Coated Copper, Chrome, Onyx, Light Gunmetal, Gunmetal. 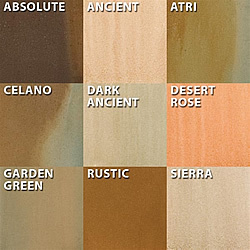 The colored options use the same 'powder coating' technology as the Clear Coated Copper, creating a beautiful colored finish which is applied over the natural copper. Powder Coating is a heat baked, enamel finish that we apply to the surface of the copper. The clear coat finish keeps the copper from turning green, adds radiance and luster to the patina finish, and keeps the fountains looking new for years to come. The protective finish has been available on a number of our best-selling fountains for the last few years. Available selection between jade green, black, or natural colored pebbles. Many of our fountains can be personalized with your company name, logo, or a special inscription. Placing a magnificent wall fountain in the lobby of your office with your company’s name or logo etched onto it makes a striking first impression. Personalized fountains are also excellent for special occasions such as weddings, and as gifts. Imagine the delight on an employee’s face when you present them with a beautiful fountain, etched with the words “Employee of the Year, 2004”! Personalizing fountains for special occasions create memorable centerpieces and serve to make gifts more thoughtful. 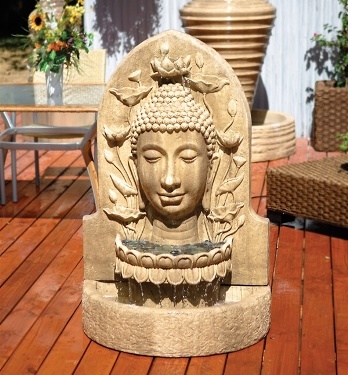 The decorative style of the Buddha Fountain makes a wonderful treat in front of your business or home. Rich in detail, this striking piece features intricate carvings around the blessed Buddha's face. Designed to be placed on the floor against a wall. Shown in Ancient finish. This fountain has the look of genuine cast stone but is much more durable and lighter for easier maintenance. Made of GFRC, made to order and ships within 4-6 weeks, arrives securely packed on a pallet. Includes assembly instructions.